Look at artists who worked in series with the landscape. Make notes in your learning log about the challenges they faced and how they tackled them. What is the meaning of “in series” does this mean several pictures in one place? I suppose Monet’s most popular paintings are those of his garden and Lily pond of which he made several different paintings . He also did many other series includimg those of the cathedral at Rouen at differing times of day and year, and of the haystacks in the neighbouring fields. He returned time and time again to the same spot to depict the same picture, varying at times the distance from the subject, but mainly studying how the picture changed with the light and time of day as well as time of year (see Japanese bridge paintings below). He would have had to sit out in all weathers and temperatures (although perhaps not as much a challenge as if he had he lived in UK), and would have worked quickly to capture the shifting light and reflections on the surface of water,(again perhaps not changing so quickly as had it been the UK—not that I’m jealous of his warm and sunny clime!) In England the changing clouds and weather probably present even greater problems as the subject changes from light to dark and from dry to wet very quickly. The challenge of finding a place where time can be spent to study and draw which does not involve dashing out of the rain. In the paintings of the footbridge in his garden, Monet starts in 1899 and early 1900s with a relatively realistic, but impressionistic view of the bridge, capturing its geometry and colour against the harmonious colours of the river and flowers. These pictures appear to capture the colours and atmosphere of different seasons. In the two later paintings, the paint is used to produce drama, both in the manner of its application and the colours in the pictures. Without the initial picture these two abstractions would be difficult to identify as the same footbridge, yet have atmosphere due to the paint, textures and colours. At a basic level the blue picture is wintry and the red/brown autumnal. As the bridge in these pai ntings was on Monet’s private land I trust there were few interuptions or people ask him to move. Pissaro ‘s Landscapes – the challenges he faced and how he tackled them”. Look at the beautiful varieties of colour ads strokes that reflect the weather and atmosphere of these apple trees drawn at different times of day and year and from differing positions. dust which can collect in the picture if wet paint is involved, many impressionists used this aspect of painting en plein air as part of their picture. Having to select in a short time period what will be included in the picture –so, to be selective about the subject and so keep the final picture simple. Whether to complete the picture at the time or to take it back to the studio. Monet often returned to the same spot to capture differing times of day. 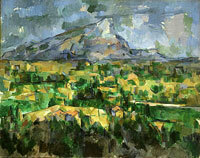 Paul Cezanne painting in the late 1800s was the fore-runner of the cubist movement, applying paint in blocks of colour. He came from Aix en Provence and painted the countryside frequently in the area.